Personalized girls duffle. 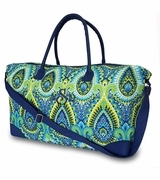 Perfect bag for weekend trips, gym, sporting events, and dance. Popular paisley pattern, in your choice of hot pink, blues and white. Add a embroidered name or three letter monogram for a personal gift. 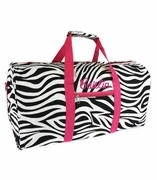 Personalized girls duffle bag measures 20"W x 11"H x 10"W. Two wide outside front zipper pockets. Over the shoulder strap included. Includes name or three letter monogram. Monogram sequence First Initial, Last Initial, Middle Initial enter into text box in that order. I ordered this same turquoise chevron w/fuschia stitching bag (just as displayed) and it turned out better than I expected! It was shipped quicker than expected. The bag is durable, large and well made. Wish I could give this bag 10 stars!!! I ordered this gift for my niece's 7th birthday. I love the size and the quality of the bag. I think it will be perfect for a young girl to take to gymnastics and dance practice. I would highly recommend my friends ordering bags from this company. This bag is fantastic, Sent one to a 12 yr old granddaughter and it arrived by her birthday.. maybe 3 days later. The soon to be 14 yr old will be receiving one also. I have 2 granddaughters left who will get this for Christmas and now all 4 mothers want to have one too. Great service, lovely sturdy bag and a great find!!! This order exceeded my expectations! The bag shipped very quickly. 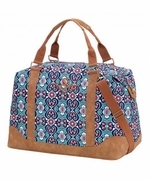 It's a very durable bag with metal feet, substantial zippers, and tough fabric that's easy to wipe clean!